If you are looking for the modern RuneScape guide for this content, please see our Rune Mysteries guide. Recent research at the Wizards' Tower has found a way to create Runes for the first time in centuries. Assist the head wizard Sedridor in his research and he too may teach you these secrets! Speak to the Duke of Lumbridge, upstairs in Lumbridge Castle. First off, head to Lumbridge Castle. A quick way to get to Lumbridge is by using the Lumbridge Home Teleport spell. Inside, there should be staircases at the back. Climb up one of them and you should arrive on another floor. One of the rooms should contain Duke Horacio. Talk to him and ask him if he has any quests for you. He will tell you about a strange talisman he found and ask you to deliver it to Sedridor, the Head Wizard at the Wizards' Tower. Accept his request and he will give you an Air Talisman. 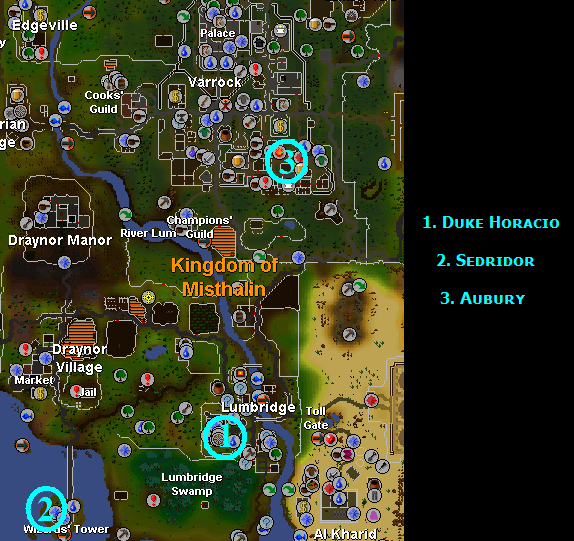 Head to the Wizards' Tower, just southwest of Lumbridge and directly south of Draynor Village. When you arrive there, enter the western room with ladders in it. Climb the ladder leading downstairs. You should spot Sedridor nearby. Speak to him and tell him that you're looking for the Head Wizard. He'll say that he is and ask you to give the Air Talisman to him. Hand it over to him and he will be stunned. He'll give you a Research Package and tell you to give it to Aubury, located in the Rune shop in Varrock, to the northeast. Note: If you happen to lose the Research Package, just ask Sedridor for another. Head off to the Varrock Rune shop. Once you arrive there, speak to Aubury. Tell him you've been sent to deliver something to him and he'll ask you to let him study the Research Package. Speak to him again and he will give you some Research Notes. Tip: If you happen to lose the Research Notes, just ask Aubury for another. Head back to the Wizards' Tower and speak to Sedridor again. Give him the research notes and he will start talking about a new skill you can use, called Runecrafting. [^] Speak to the Duke of Lumbridge (Lumbridge Castle) and ask for a quest. [^] Speak to Sedridor (Wizard Tower) and give him the Air Talisman. [^] Speak to Aubury (Varrock Rune Shop) and give him the Research Package. [^] Speak to Aubury again. [^] Speak to Sedridor and give him the Research Notes.